Fire is a fundamental thing and people love lighting them. It is a great skill to have especially in outdoor learning for schools. Making sure that you are safe around it and know how to be have safeguards both you and the environment. I use a fire starter (flint and steel) that creates sparks to start fires. Marshmallows are always popular to cook and they definitely taste better when you cook them on a fire you have light yourself. ​You can combine shelter building with making camp fires or add den making to have a great day out. 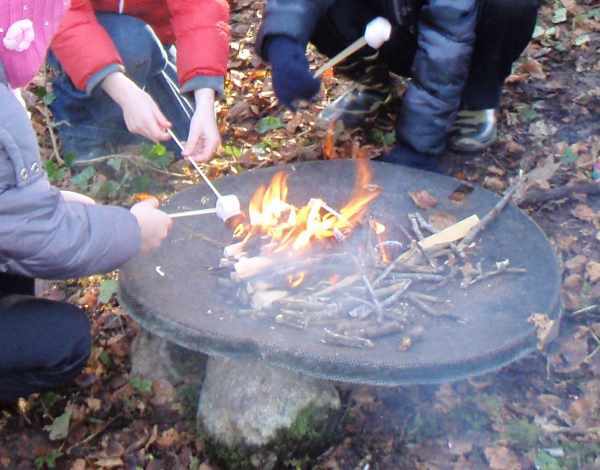 Or you can use the fire and do some camp-fire cooking or make some charcoal which you can use to create some woodland art. I have also introduced new 'out after dark' activity where you can make a fire and do some other activities after dark, you might even be able to see some stars.